Satisfying and bursting with flavor, try this salad in the summer and take it with you into fall by subbing apples for nectarines. Preheat the oven to 375° F. Toss the chicken breasts with 1 tablespoon olive oil, garlic, salt and pepper and place on a rimmed baking sheet. Bake in the oven for about 20 minutes until chicken is thoroughly cooked. Remove from the oven and allow to cool. When cooked chicken is cool to the touch, slice or dice into bite-sized pieces. While the chicken is baking, place 2 cups of water in a saucepan and bring to a boil. Add quinoa, stir, and cook, uncovered for 15 minutes. Set aside to cool. In a large mixing bowl, gently toss together the cooked quinoa with the cranberries, nectarines, nuts, herbs, olive oil and vinegar. Season with salt and pepper to taste. 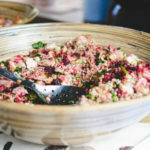 To serve, place a scoop of the quinoa salad on each plate, top with chicken and sprinkle with goat cheese. High in protein, this main-dish salad transitions from summer to fall when you use chopped Granny Smith apples and raisins instead of nectarines and dried cranberries. Use leftover cooked chicken or prebaked marinated tofu for a quick weeknight meal.